The freezing temperatures have us dreaming of sunny weather and summer wardrobes! 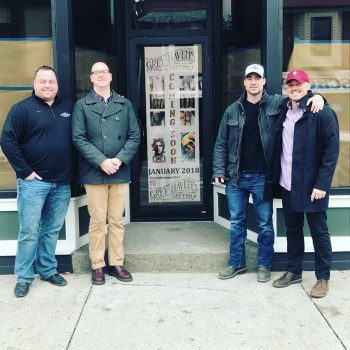 With a passion for local art, the Larkin Square team is opening submissions for a new t-shirt design to be sold at public events (Food Truck Tuesdays and KeyBank Live at Larkin) as well as LDG properties throughout Larkinville. 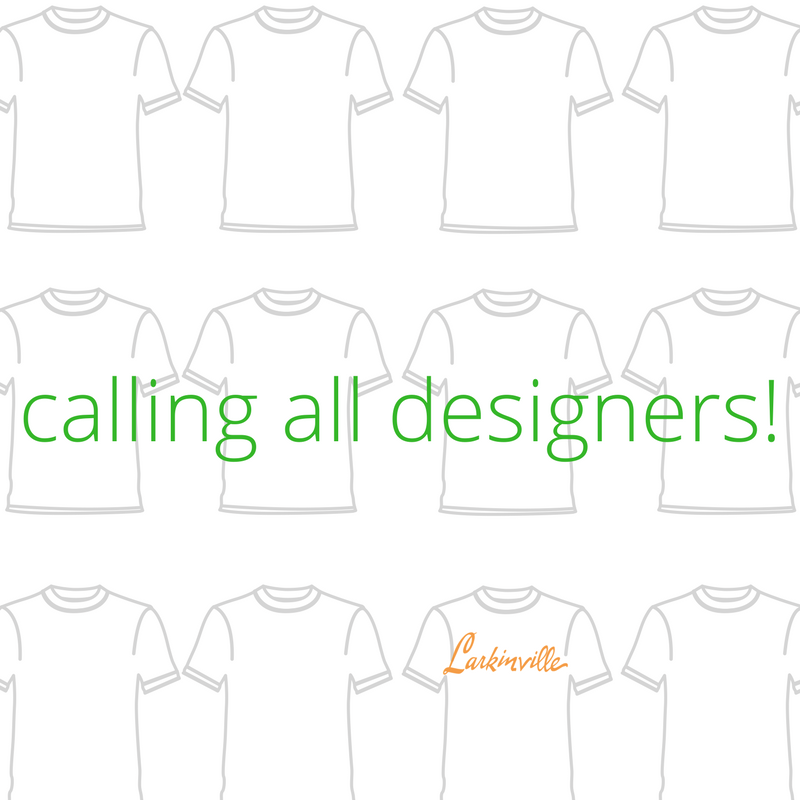 For the next month, our team will be accepting design submissions and will choose one winning design to be printed. The winning designer will receive $500 and the chance to have their shirt sold throughout the square! If interested, please submit a PDF of your one-color design (feel free to show us how your design looks on a t-shirt!) 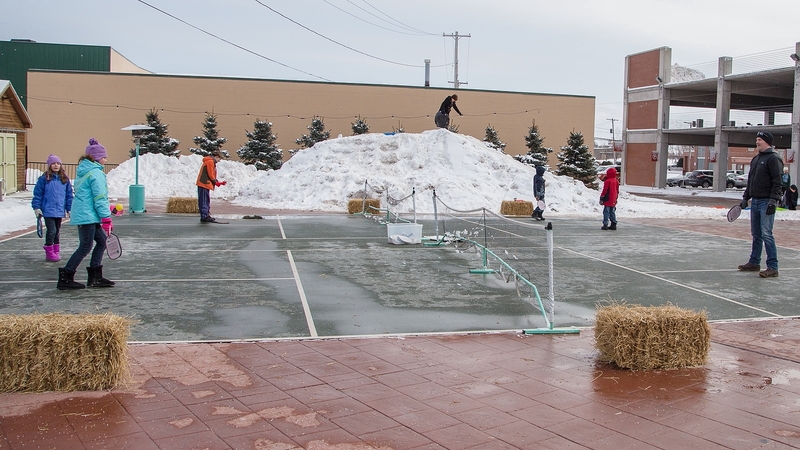 Designs must be family-friendly and incorporate the fun, whimsical and community feeling of Larkin Square. All designs must be submitted by February 5th to bridgets@larkinsquare.com and include the artwork application. Submitted artwork without an application will not be accepted. Wednesday, January 24 5:30 pm – 6:45 pm, Larkin Square Filling Station. The Larkin Development Group (LDG) began the transformation of the neighborhood we now call Larkinville in 2002. Through enormous hard work, dedication and investment by the LDG along with many other developers and businesses, the neighborhood has become a national model for repurposing older buildings to new uses and bringing a neighborhood back to life. Exciting developments are now in the works down the road from Larkinville on Seneca Street in South Buffalo. 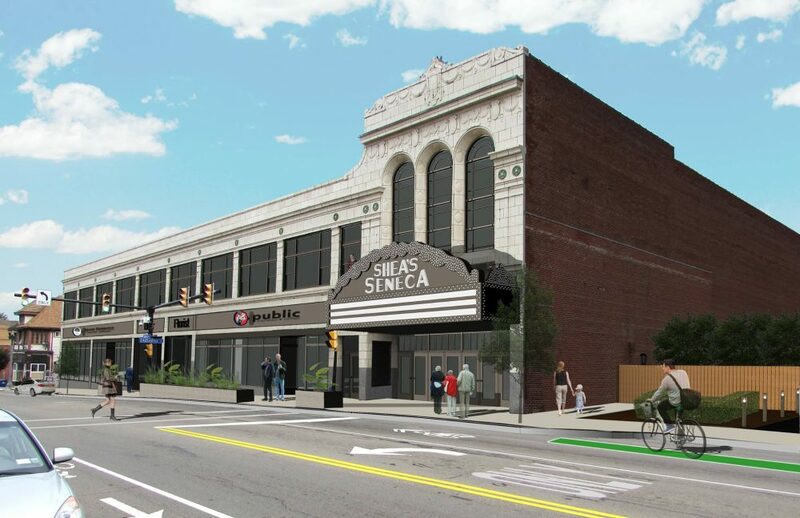 Projects include the former Sheas Theater, a church and school and other buildings finding new life in South Buffalo near the historic Olmsted designed Cazenovia Park. On Wednesday, January 24th, 2018 from 5:30 pm – 6:45 pm, in the Filling Station, The Larkin Square Author and Speaker series invites you to join us for a preview and discussion with developers Gino Gatti, John Otto and Peter Scarcello, Buffalo firefighters and the partners of Hook & Ladder Development LLC, Jake Schneider, of Schneider Development Services, who is developing the historic Shea’s Seneca Project and Karl Frizlen, of The Frizlen Group, who is leading the conversion of the former St. Theresa’s parish school. Established in 2012, Hook & Ladder Development is a real estate holdings company owned and operated by three Buffalo Firefighters. They have dedicated their lives to serving our city and are committed to its continued revitalization.Hook & Ladder has redeveloped a series of storefront properties on Seneca Street and is now working on plans to redevelop the 19th century former St. John’s Church. Jake Schneider is the driving force behind The Shea’s Seneca project, located at 2178 Seneca St,. this is the adaptive reuse of 50,000 square feet of historic infrastructure originally constructed in 1929 by Michael Shea. When complete, the new mixed use facility will include 23 new apartments (The Skyroom Lofts), a 12,000 sf banquet facility (Shea’s Seneca Catering) and new commercial storefronts (Public Espresso Coffee and Bakery and others storefront tenants yet TBD). 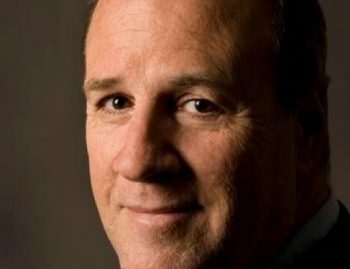 Karl Frizlen, principal The Frizlen Group Architects has been actively involved in the transformation and planning of several historic neighborhoods including projects in the Elmwood Village. He is now near the completion of a school project in the Seneca Street Corridor, the redevelopment of the old St. Teresa’s Parochial School into the School Lofts @ Seneca, featuring 37 loft style apartments. Each Developer will share photos of their projects, talk about their interest in South Buffalo and plans for the future as well. 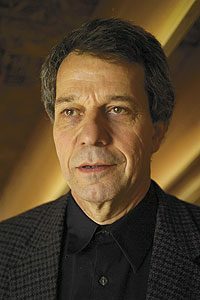 There will be time for questions and answers as well. 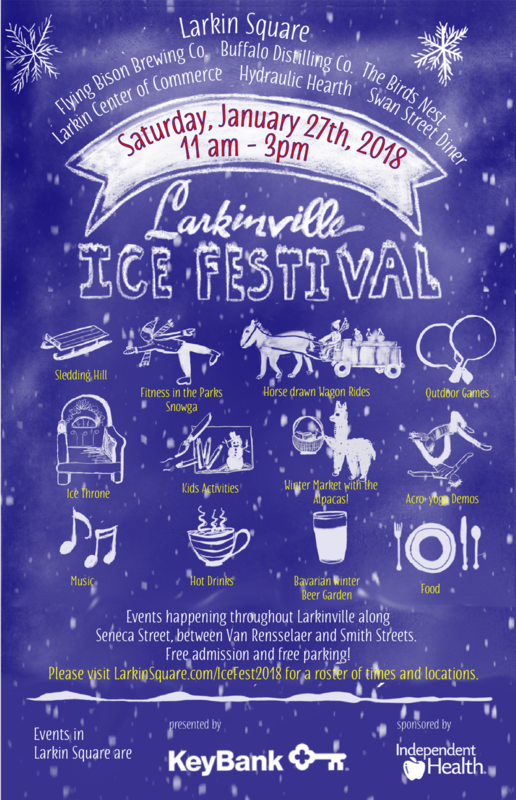 Head to Larkinville on Saturday, January 27 for the 4th Annual Ice Festival! This neighborhood wide celebration includes programming and specials from Larkin Square, The Filling Station, Hydraulic Hearth, Swan Street Diner, Buffalo Distilling Company, Flying Bison Brewing Company and Larkin Center of Commerce. 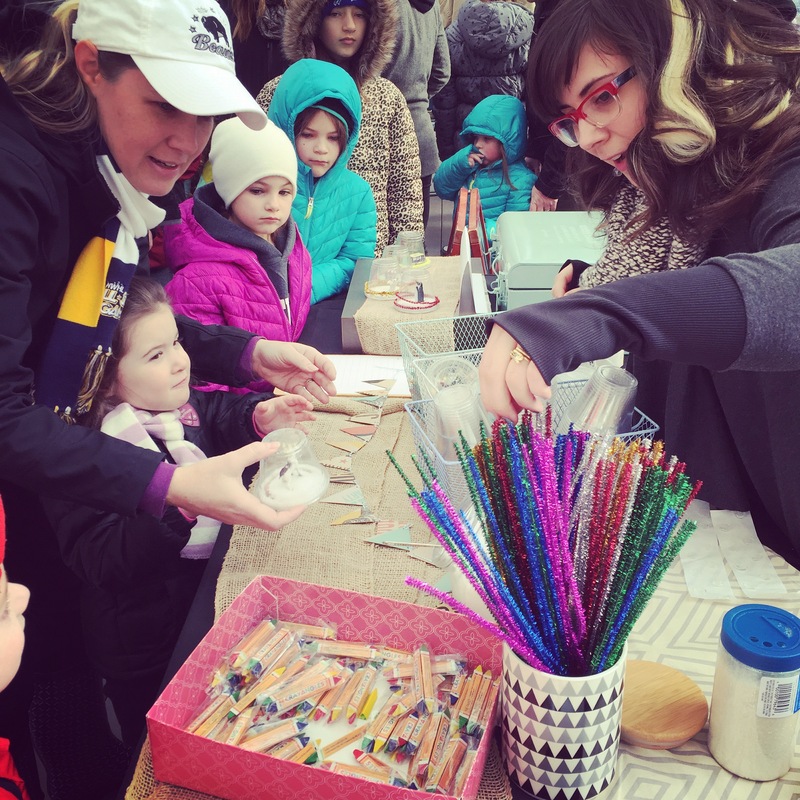 Bring the family to Larkin Square to enjoy a range of activities for kids and a local vendor market on the heated boardwalk. Explore the neighborhood through horse drawn carriage rides and grab a bite to eat at the participating restaurants! A full list of programming is below, stay tuned for updates. As always, Larkin Square has free event parking and this event is free and open to the public courtesy of presenting sponsor KeyBank and sponsor Independent Health. Performers throughout the square from The Bird’s Nest Acro Circus. Ice Fest Specials on the menu including frozen hot chocolate! 12pm: Buffalo Groundhog Day 5th Anniversary featuring live music, food trucks and an appearance from Buffalo Mack. 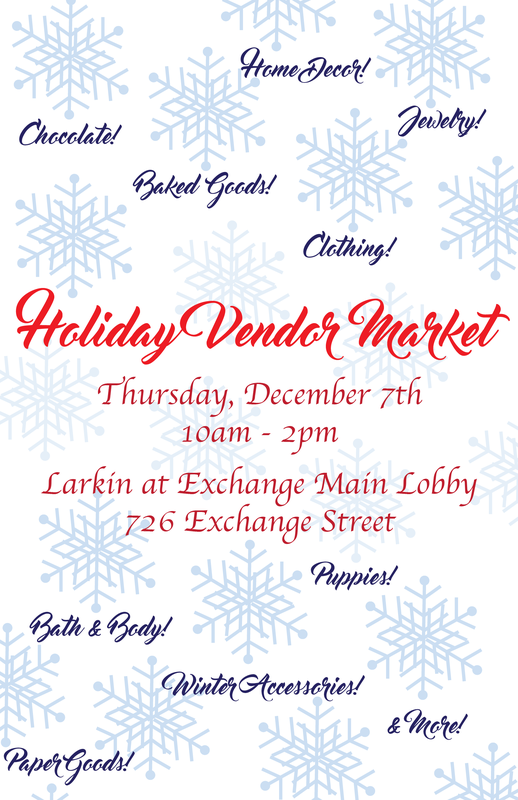 Stop by the Larkin at Exchange Building (726 Exchange Street) on Thursday, December 7 from 10am – 2pm to shop our Holiday Vendor Market. Get ready for the Holidays with over 30 vendors (complete list below)! If you are coming to the market from outside Larkinville, you are welcome to park in the Visitors Lot on Exchange Street or in the Lot next to the Hydraulic Hearth. Make a day of it and stop by the Filling Station for lunch before or after shopping! 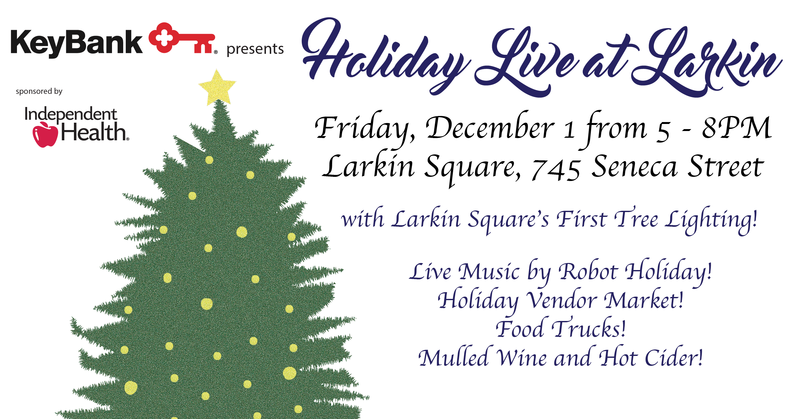 Kickoff the holiday season at Larkin Square! On December 1, Larkin Square is back with a special edition of KeyBank Live at Larkin celebrating the upcoming holidays. From 5pm – 8pm, guests will be able to enjoy food trucks, specialty drinks including mulled wine and hot cider, alpacas from Thistle Creek Alpaca Farm and shopping with a few vendors in the square. Robot Holiday will be rocking all night long with their unique spin on holiday music. New this year, Larkin Square will feature a tree lighting in the middle of the square! Don’t miss this special family-friendly event. Admission is free thanks to Larkin Square’s presenting sponsor KeyBank and sponsor Independent Health. Free parking is located in the event lot at 111 Hydraulic Street. Handicap parking is available in a dedicated lot at Seneca and Emslie Streets. There is additional parking in the lot behind Swan Street Diner at 700 Swan Street. 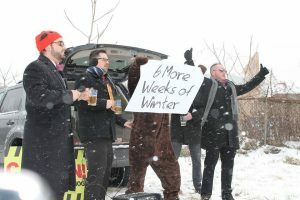 This event will be outdoors, be sure to bundle up!